VitrA is a leading manufacturer of high quality sanitaryware and bathroom accessories. 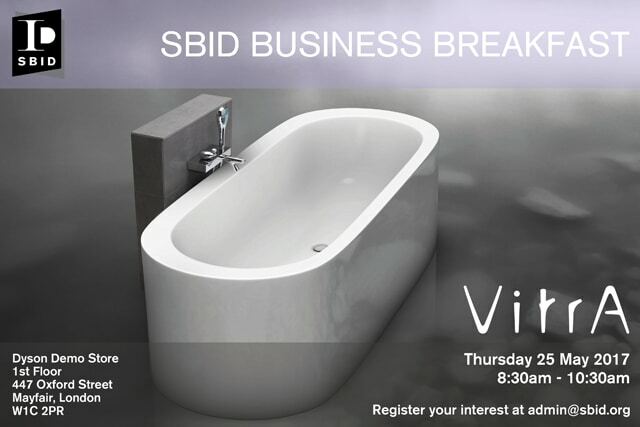 We would be delighted for you to join SBID and VitrA for a Business Innovation Breakfast hosted in Dyson’s demo store in Mayfair. With 6 million pieces of sanitaryware produced each year and distributed throughout 75 countries, VitrA produce innovative bathroom products, combining modern technology with world-class design to meet the style standards and demands of the 21st Century. Having completed bathroom projects for Heathrow Terminals 2, 3 and 5, Marks & Spencer and Holiday Inn Hotels to name a few, VitrA are a highly sought after solution partner for architects, engineers and developers involved in prestigious contract and residential projects around the world. VitrA also have a strong retail presence in the UK with over 1000 stockists. This is a great opportunity to meet other designers, VitrA and the Dyson contracts team in an informal setting to discuss industry opportunities over breakfast and perhaps to learn a little more about the collaboration between Dyson and VitrA. To RSVP to this event please email [email protected]. Space is limited.